Welcome to the October Changelog! 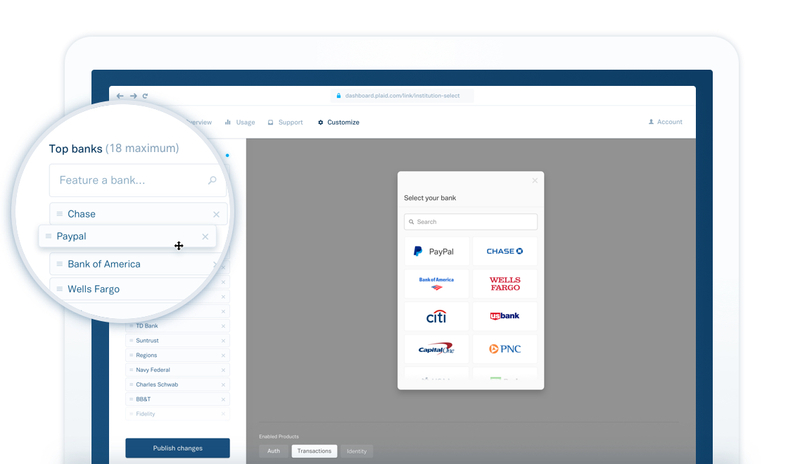 This month, we shipped our usual financial institution upgrades along with a refresh to our docs, a revamped developer onboarding experience, and more customization features for Link. Check out the details below. This month, we added Auth support for 25 institutions, including First Financial Bank and Utah Community Credit Union, bringing our total number of Auth supported institutions to more than 1,700. On top of that, we upgraded integrations with several large institutions, resulting in support for more than 400 days of transaction history upon initial account linkage for Discover Card and more than two years for Chime Bank, North Carolina State Employees’ Credit Union, and Woodforest National Bank. We know how important simple, easy-to-use docs are. That’s why we recently redesigned our docs to make building with Plaid an even better experience. We simplified the layout, reorganized the navigation, and brought code snippets front-and-center. We’ve also added a search functionality to help you find what you’re looking for faster. Check them out, and let us know what you think! This month, we released a feature that gives you more control over what institutions feature most prominently in Link. You now have the ability to choose which institutions to include on the institution select pane in Link, and you can control in what order they appear. Since this is what end-users first see when opening Link, it will help them find their institution more quickly and easily, making it even more likely that users successfully connect their account. As always, this feature is configurable from the Dashboard, and you can get started customizing today.